Morality is a funny thing. A) John Kerry believes the Assad regime (like the UN General Secretary and almost everyone else – probably even the Russians, though they will not admit it) to be guilty of crimes against humanity, including the recent gassing of 1400 mostly “innocent” women and children hiding in basement cellars to escape the gas. B) The Russians are strong supporters of Assad. Indeed, without their support Assad would most likely have been overthrown already by a popular revolution hi-jacked by even nastier people thanks to the passivity of the free world. 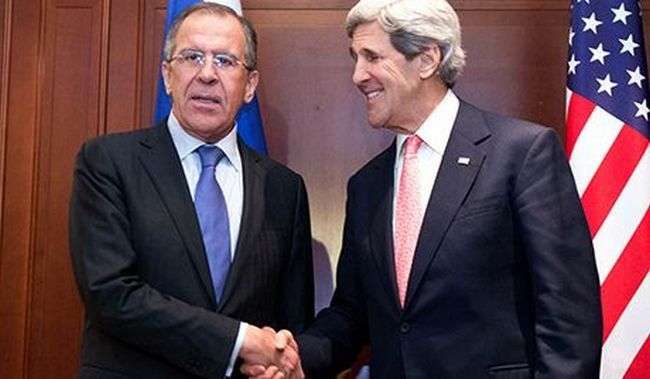 C) Kerry is photographed smiling jovially and shaking hands with the Russian Foreign Minister. You may HAVE to negotiate with accomplices to mass-murder, but smile and shake their hand? It reminds me of George Galloway shaking the hand of Sadaam Hussein and telling him he was doing “a good job”. The same Galloway went on to found a party called “Respect”, and you REALLY could not make THAT one up. In addition of course, the free world trades freely with another dictatorship, China, without whose support the hideous North Korean regime could almost certainly not survive. What does that collectively make the people of the free world if not accomplices to accomplices of genocide, torture, mass-oppression and appalling suffering on a gigantic scale? A) Supporters of cheap tellys would say that, wouldn’t they? B) Actually, “No”. Some things really ARE black and white. The end of the world must be approaching, since apparently the Gods make mad whom they seek to destroy and to judge by many comments on Syria madness is indeed stalking the land. You may not have heard of Kosovo, a land whose people were being ethnically cleansed until the USA drove out the fascists. (and please note, there is NO OIL IN KOSOVO.) You may indeed not have heard of the Japanese Empire, guilty of multiple atrocities throughout Asia until stopped by the USA. But surely you have heard of Hitler, whose attempt to wipe out the Slavs, Jews, gypsies and handicapped was halted both – in the first case – by the intended victims but also by the USA and others. There are extremely nasty people in this world, not least the family-dynasty, gangster-thug, mass-murdering despot Assad, and the only way for these people to thrive is for the free world to do nothing. The current approach of many in the UK is generalistic (Each case has to be considered on its merits), selfish and indeed brainless. Ordinary people in Syria are being killed by the tens of thousands, not only by shells and bullets but now also by mass-gassing. To stand by and do NOTHING is an act of stupefying selfishness and immorality. OF COURSE it is complicated. You want to live in a simple world? You should have been born an ant or on some other planet. I believe Mars is for the moment quite peaceful and free of despots. Idiocy stalks the planet. Sometimes you have to carry out military action to avoid war and/or prevent worse horror. Had France and Britain invaded the Rheinland in 1936 no-doubt the illiberal unintelligentsia would have been blathering on about “warmongers” and “illegitimacy”, but WWII might have been avoided. In any case, what is proposed (wrongly as it happens) is NOT “war” but enough punishment to Assad to deter him from mass-murder by gassing in the future. The headless chickens are really on the rampage …..
A) NO undemocratic government has ANY legitimacy to rule a country, as it obviously does so by force alone, the will of the people being irrelevant. B) Many UN states are undemocratic. The largest is a dictatorship and Russia a quasi-fascist kleptocracy. ERGO: The idea that the UN has ANY authority is ludicrous. It should be limited to democratic states. The rest of the assorted fascist and/or family-dynasty despot states should be excluded until they decide to join the civilised world community. Ignore the UN – is is an utter sham. GADDAFI WAS ELECTED A MEMBER OF THE UN HUMAN RIGHTS COMMITTEE for God’s sake. Mugabe’s blood-soaked regime is a member, quite apart from all the rest.